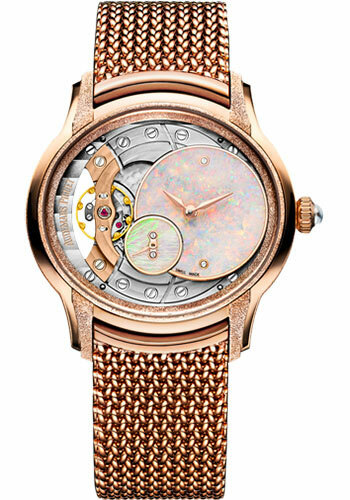 39.5 mm hammered and satin-finished 18K pink gold case, 9.8 mm thick, sapphire crystal back, crown set with a translucent sapphire cabochon, white opal off-centred disc and small second counter dial with pink gold hands, Manufacture 5201 hand-wound movement with hours, minutes, small seconds, approximately 49 hours of power reserve, 18K pink gold bracelet, folding buckle , comes with additional alligator straps in light blue and black. Water resistant to 20 m.
39.5 mm 18K white gold case, 9.8 mm thick, sapphire crystal back, crown set with a pink sapphire cabochon, diamond-set bezel, white mother-of-pearl off-centred disc and small seconds counter dial with anthracite Roman numeral transfers, pink gold hands, Manufacture 5201 hand-wound movement with hours, minutes, small seconds, approximately 49 hours of power reserve, 18K white gold bracelet, folding buckle. Water resistant to 20 m.
39.5mm 18K white gold case, 9.8mm thick, glareproof sapphire crystal back, diamond-set end pieces, diamond-set bezel, glareproofed sapphire crystal, openworked dial with white mother-of-pearl off-centred disc and small seconds counter, anthracite printed Roman numerals, pink gold hands, Calibre 5201 hand-wound movement with hours, minutes, small seconds, approximately 54 hours of power reserve, beige large square scale alligator strap, 18K white gold pin buckle. Water resistant to 20 meters. 39.5 mm 18K pink gold case, 9.8 mm thick, sapphire crystal back, crown set with a pink sapphire cabochon, diamond-set bezel, white mother-of-pearl off-centred disc and small seconds counter dial with powdery gold-toned Roman numeral transfers, pink gold hands, Manufacture 5201 hand-wound movement with hours, minutes, small seconds, approximately 49 hours of power reserve, 18K pink gold bracelet, folding buckle. Water resistant to 20 m.
39.5 mm 18K white gold case entirely set with diamonds, 9.8 mm thick, glareproofed sapphire crystal back, crown set with a blue cabochon sapphire, glareproofed sapphire crystal, dial with diamond-paved white gold off-centred disc, anthracite printed Roman numerals, white mother-of-pearl small seconds counter with diamond-set ring, blued gold hands, Manufacture 5201 hand-wound movement with hours, minutes, small seconds, approximately 54 hours of power reserve, large square scale pearly dark grey alligator strap and additional black alligator strap, diamond-set 18K white gold pin buckle. Water resistant to 20 meters.